Takumi Saitoh is a Japanese actor and model, well known for starring with Aya Ueto in the popular romantic TV-series-turned-film “Hirugao”; his 2017 directorial debut “Blank 13” was a film about a problematic father/son relationship and it turned up to be a very pleasant surprise. The enigmatic title refers to a 13-year gap in the relationship between Koji (Issei Takahashi) and his father (Lily Franky), a pathological gambler who had suddenly vanished in thin air, leaving behind the wife and their two children. If on one hand his disappearance had freed the family from an inconsiderate father and the constant stream of deb collectors and troubles that came with him, on the other had forced Koji’s mother to work nights and days to make ends meet and consequently leave the two boys to their own devices. All in all, lots of reasons to resent the man and it doesn’t come as a surprise that when Koji’s older brother (Takumi Saitoh) announces he has some news about the father after 13 years, nobody really jumps in excitement. The man is very ill, he has only three months left to live, but his wife and older son have no compulsion to go and see him; they are still profoundly wounded, and they haven’t forgiven him yet for what his carefree life choices have caused to all of them. But Koji on the contrary, still treasures one thing that still links him to his father and that is their shared love and passion for baseball. It’s not much, but that only time the father took him to the stadium and those sporadic times he played throw and catch with the boy are the only things that spell “father” to Koji and therefore he decides to go and see him. In reality, the narration doesn’t follow a linear timeline; it starts with a humorous episode at the man’s funeral where the sparse guests are compared to the huge crowd attending another funeral next door and introducing immediately the theme someone’s value measured on the base of the love legacy left behind. To follow the funeral introduction, a series of rather intense and sorrowful flashbacks show us the back story of the family – when the father was still leaving with them – and half way through the movie, all of a sudden, the title appears and the narration changes abruptly its tone. The few guests at the funeral start talking spontaneously about their friendship and interaction (mainly around gambling) with the deceased and telling a series of funny episodes and quirky memories in front of the incredulous sons’ eyes. “Blank 13” is an unusual and refreshing movie, based on a true story (it happened to one of the director’s friends), not particularly original but told with empathy and great attention to details. The director has explained in the Q&A that followed the screening at LEAFF 2018 that he filmed everything in a week, using an interesting mix of techniques. The cinematography of the flashbacks was inspired by Christopher Doyle’s use of saturated colors and a coarse grain, making them extremely vivid and touching. 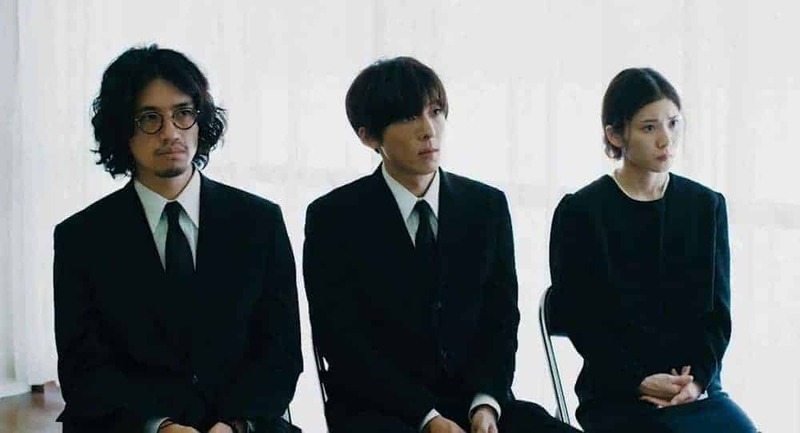 On the contrary, the funeral part is filmed like a documentary: the characters were given freedom of improvisation, some of them are real comedians, other were casted only because of their weird aspect, and their impromptu tributes to the dead friend are caught in skillful long takes. The effect of this strange mix is surprisingly organic and amusing. Quite interesting it’s also the sudden switch from the initial dramatic mode to a lighter and comedic atmosphere, especially because usually it’s the other way around. Saitoh explained he got the inspiration by some Japanese bread rolls that have different flavours all together. An unusual source of directorial inspiration indeed but – considering the result – one cannot disapprove it! A terrific presence that haunts the whole work is the mother (Misuzu Kanno). We see her very little, often from behind and she has very few lines but the whole film is filtered through her character and her sorrow, creating an indirect effect of presence, frail and at the same time very relevant. Takumi Saitoh has composed “Blank 13” with maturity and great care for the storytelling and its structure. A rather promising debut; it will be intriguing to see his sophomore work, especially after Saitoh saying in the Q&A that it will be a totally unexpected piece of work.